Variable-Leaf Desmodium is a prostrate herb, up to 40 cm long; branches loosely hairy, slender. Leaves are 3-foliolate; leaflets 1-2.2 x 0.5-1 cm, ovate-elliptic or obovate, base blunt, tip rounded, hairy when young, becoming hairless on ageing; leaf-stalk to 2 cm long; stipules 2-5 mm long, ovate-lanceshaped, striped, fringed with hairs on margins. Flowers are borne in leaf-axils, in 1-4-flowered racemes; flower-stalks 6-12 mm long. Sepal-tube is broad; sepals 2-2.5 mm long, triangular with subulate tip, loosely hairy without. 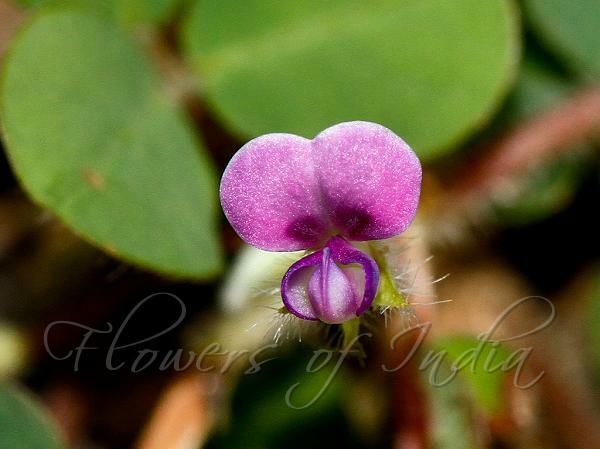 Flowers are pink, pea-flower shaped, 3-4 mm long. Ovary 1.5-2 mm long, hairy. Pods are 1.5-2 x 0.4-0.5 cm, 4-5-jointed, compressed, dorsal suture continuous, ventral constricted. 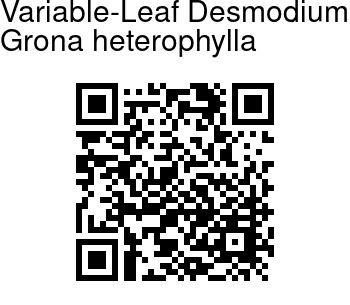 Variable-Leaf Desmodium is found in Indo-Malesia and China. Identification credit: P.S. Sivaprasad Photographed in the outskirts of Coimbatore, Tamil Nadu.